NOTE: Laff-A-Lot created by Erik Larsen, with help from John Cleary. Laff-A-Lot was one of Kill-Cat’s greatest enemies, for more than reason. 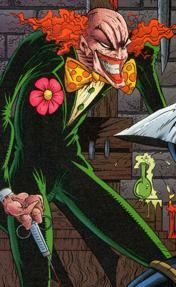 Not only was he a criminal genius, Laff-A-Lot also held an all consuming crush on the hero. During one encounter, Kill-Cat was kidnapped and given a drug that would cause him to fall in love with the first person he encountered. Laff-A-Lot was to be that person but the Kid Avenger got in the way, momentarily causing a great deal of awkwardness between the members of the Deadly Duo. Laff-A-Lot later moved to Chicago where he joined the Vicious Circle and took part in a battle against the invading Tyrrus Combine. He was killed alongside numerous other villains as the aliens tore through the ranks of the villains.